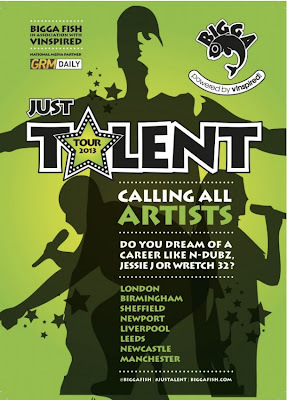 2013 is looking like a GREAT year for the events youth organisation Bigga Fish as they have just announced their 'Just Talent' tour. 'Just Talent' is a tour to seek out and shine a light on the best up and coming musical talent from around the UK in association with vinspired and GRM Daily. The programme begins in February and will be visiting 8 cities, holding open auditions for 14-25 year old (singers, groups and MCs) in London, Birmingham, Sheffield, Newport, Liverpool, Leeds, Newcastle and Manchester! The auditions will give young people the chance to showcase their musical skills to a band of 4 industry judges comprising of booking agents, A&Rs, marketing professionals, a representative from the Bigga Fish street team and special musical guests along the way. After a semi-finals round in April, the Grand Finale will take place in London in May, where 8 finalists will perform to an audience of 500 people. The top 3 acts chosen by the judges will be rewarded with a great selection of industry prizes including studio time, a professional music video, a PR package and song-writing workshops. Interested musicians should visit http://biggafish.com for entry requirements!